Digi recently unveiled its Samsung Galaxy S7 edge bundles, allowing you to get the upcoming smartphone from Samsung from as low as RM1,449. Available from 18 March 2016 onwards, the telco is offering an additional RM200 discount but you’ve got to hurry, because the promotion is limited to the first 50 customers only. You can get the Samsung Galaxy S7 edge from Digi with one of the telco’s latest plans with Internet Rollover – Digi Postpaid 68/98/148/238. Digi did not mention the contract duration, but it should be the usual 24 months contract. The Samsung Galaxy S7 edge is available at participating Digi stores from 18 March 2016 onwards. Check out Digi for a list of participating stores. 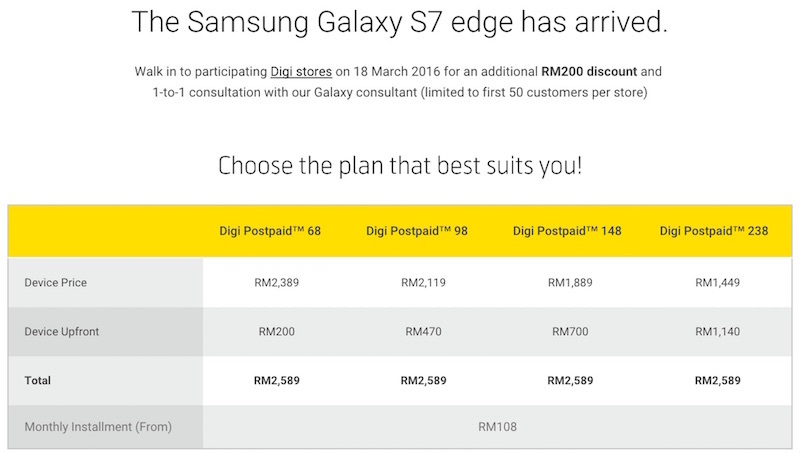 As mentioned before, the first 50 customers per store to purchase the Galaxy S7 edge from Digi will receive an additional RM200 discount, as well as a 1-to-1 consultation with a Galaxy consultant. For those who prefer shopping at Digi’s online store, you will not be able to get the RM200 discount, but don’t be disheartened. 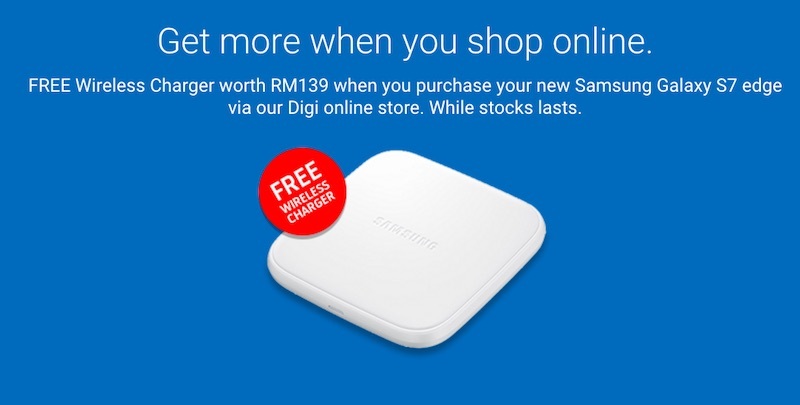 The telco is offering a free wireless charger worth RM139 when you purchase the new Samsung Galaxy S7 edge via Digi online store (while stocks lasts). Check out Digi now for more information, or visit our previous posts for more information about Digi’s latest postpaid plans, and the Samsung Galaxy S7 edge.